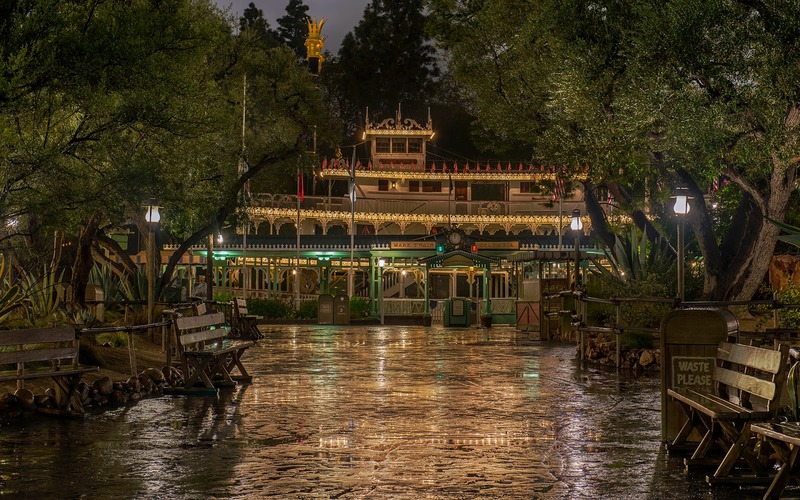 Over the past year, the Mark Twain has sat docked at the river side of Frontierland, serving more as a lookout point and part-time entertainment venue than the majestic sailing vessel it normally is. This is, of course, due to the reconfiguration of the Rivers of America to make way for "Star Wars" Land, which has left the back half of the river distinctly barren. But while this paddle boat may be deprived of its main function, it still looks as lovely as ever. And when it's an evening when rain has fallen, the sparkling reflections make it and even more beautiful scene! The Mark Twain sits, docked, at the end of the path to Frontier Landing.